Canadian guitarists Adam Cicchillitti & Steve Cowan play Choro: The Joyful Lament for Villa Lobos for 2 guitars (2014) by Canadian composer Andrew Staniland (b.1977). This comes via Cowan’s great YouTube Channel. Video by Drew Henderson. Some great ensemble work here from intricate exchanges and articulations to planned out shaping. The piece only really made sense to me when I found out who it was written for with all though lines (for Goryachev?). “Choro: The Joyful Lament for Villa-Lobos was written for Soundstreams and premiered by guitarists Fabio Zanon and Grisha Goryachev in 2015. 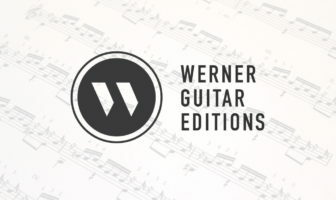 It is a virtuosic showpiece full of clever echoes and extended guitar techniques that never loses its momentum from beginning to end.” Cicchillitti plays a guitar by Jean Rompré & Cowan plays a guitar by Bruno Boutin.